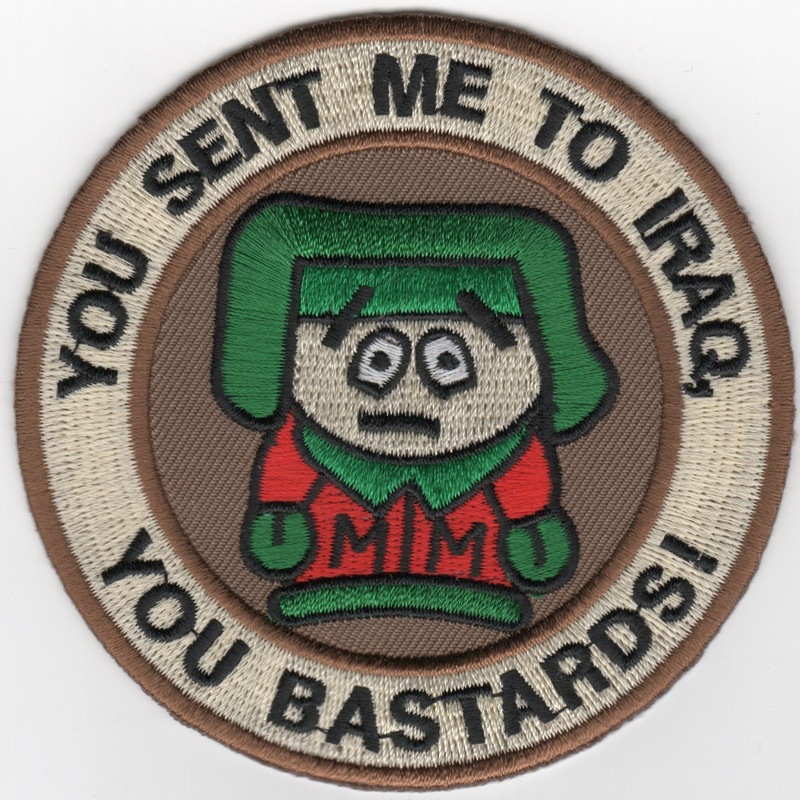 This is the patch created for the GA and KS Air National Guard units when their B-1Bs were taken from the two Guard units and given back to the Active Duty USAF in 2002. We were not happy!!! 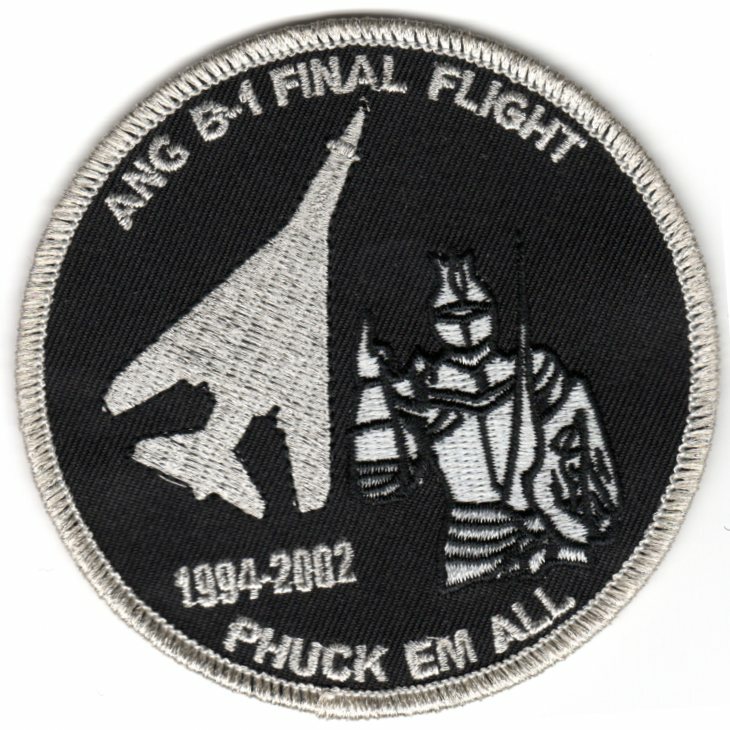 It says "ANG B-1 FINAL FLIGHT" across the top and "PHUCK EM ALL" along the bottom with the planform of the Bone in silver thread and the "Knight" giving the "You're Still #1" signal in gray/black. This was a sad day for us, as that is one of the greatest warbirds ever built!!! This patch does not have velcro attached. 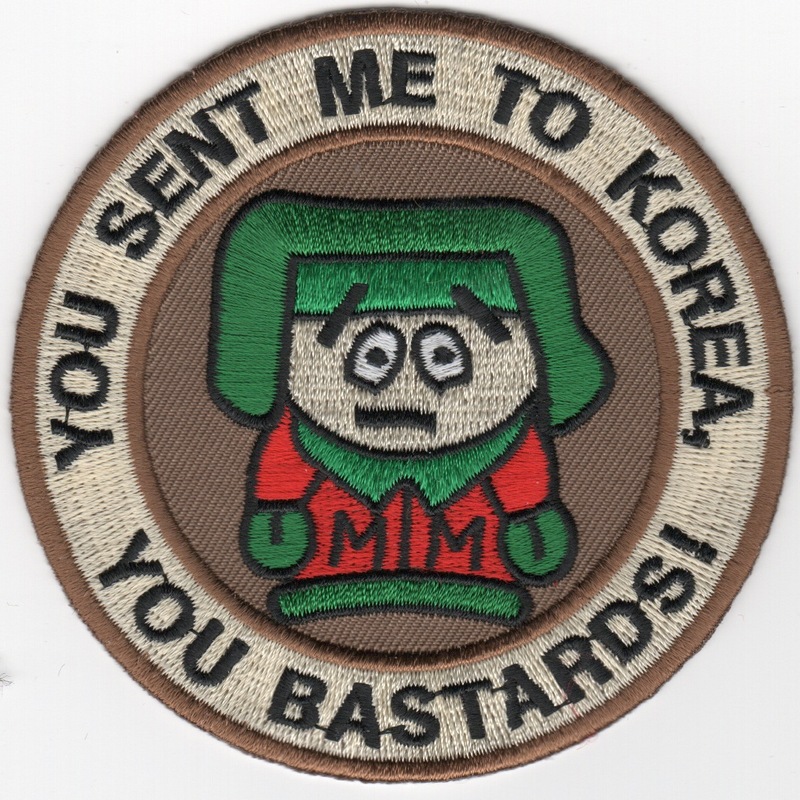 This is the latest patch from the Weapons School for the B-1. It is the 10th Anniversary of the B-1 division of the USAF's hardest, but best school. This is definitely going to be a collector's item, and I could only get a few. This is the B-1B "Baghdad" patch that says (top) "WHEN IT'S TIME TO HUSTLE" (bottom) "BRING IN THE MUSCLE". The is a B-1B 'gaggle' patch that depicts 3 Bone units. On the sides of the patch it says "24-7, 365". 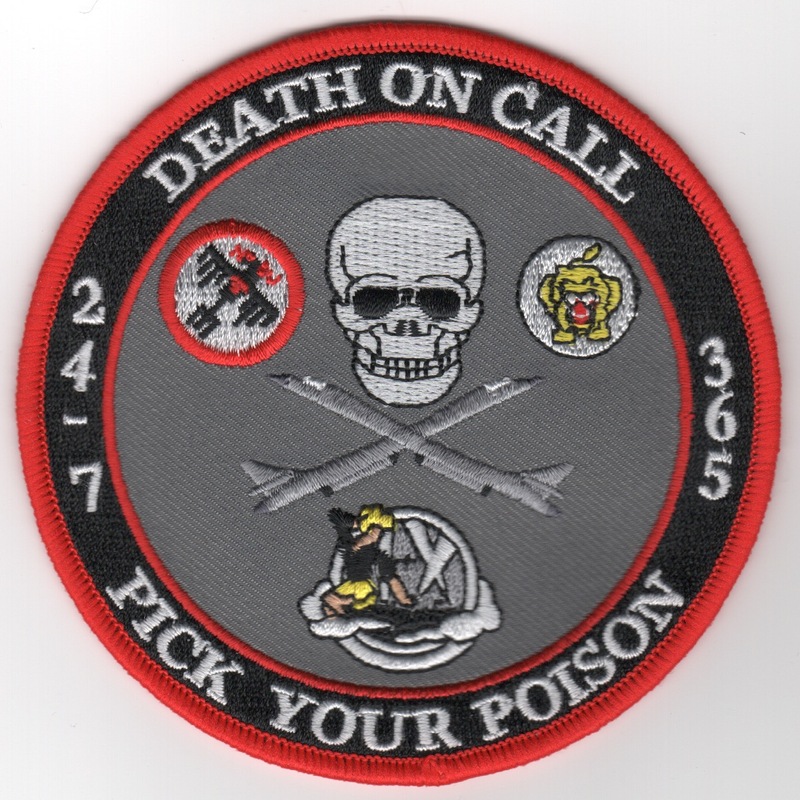 On the top of the patch it states, "Death On Call" and along the bottom, "Pick Your Poison". It does not come with velcro attached. 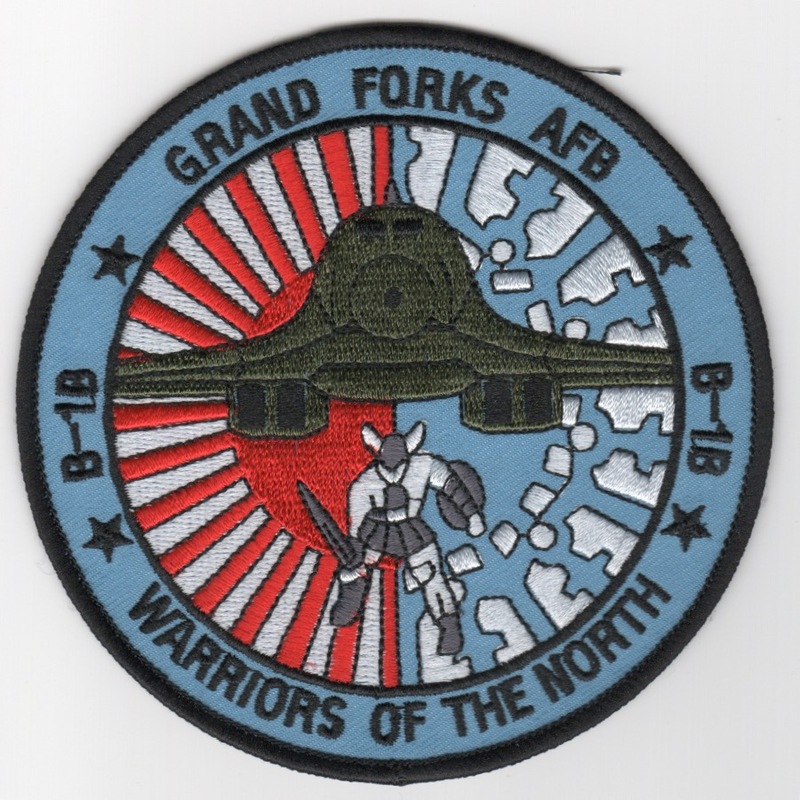 This is the base patch for Grand Forks AFB, the self-proclaimed "Warriors of the North". They no longer have B-1Bs, nor the base, as it was shut down and the aircraft moved to other units. This patch does not come with velcro attached. 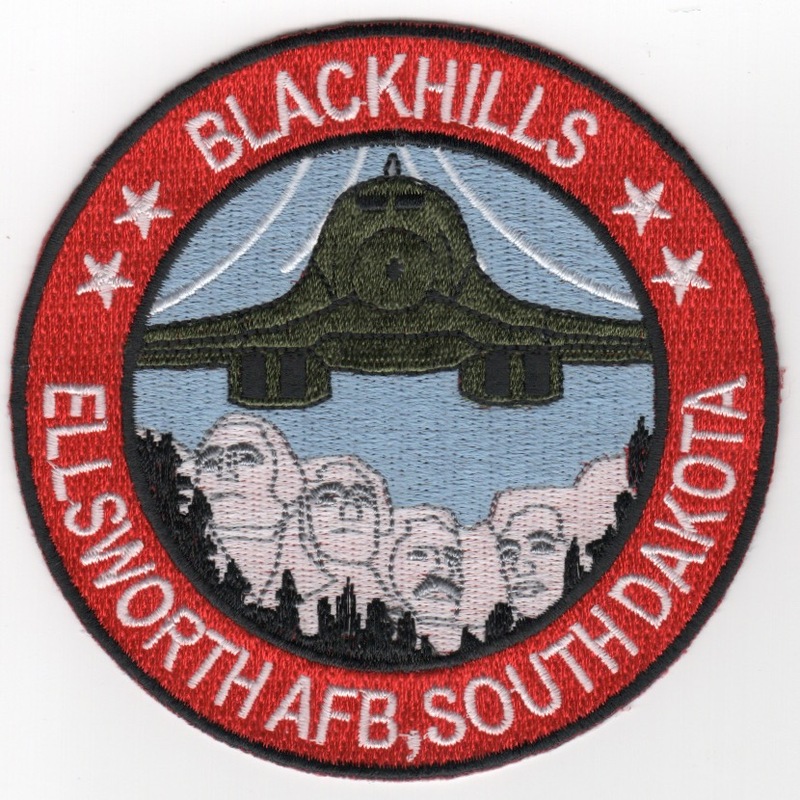 This is the base patch for Ellsworth AFB, the self-proclaimed "Blackhills". They still operate the B-1B Lancer out of there, as well as the B-1 Weapons School. This patch does not come with velcro attached. 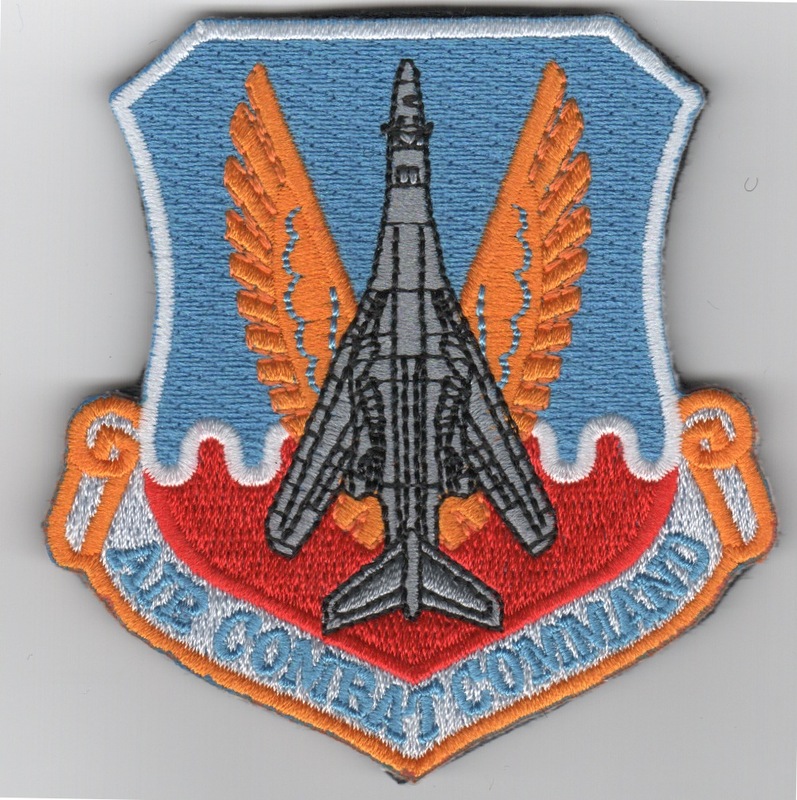 This is the color version of the patch worn by the Edwards B-1B Test Team. This is the subdued version of the patch worn by the Edwards B-1B Test Team. 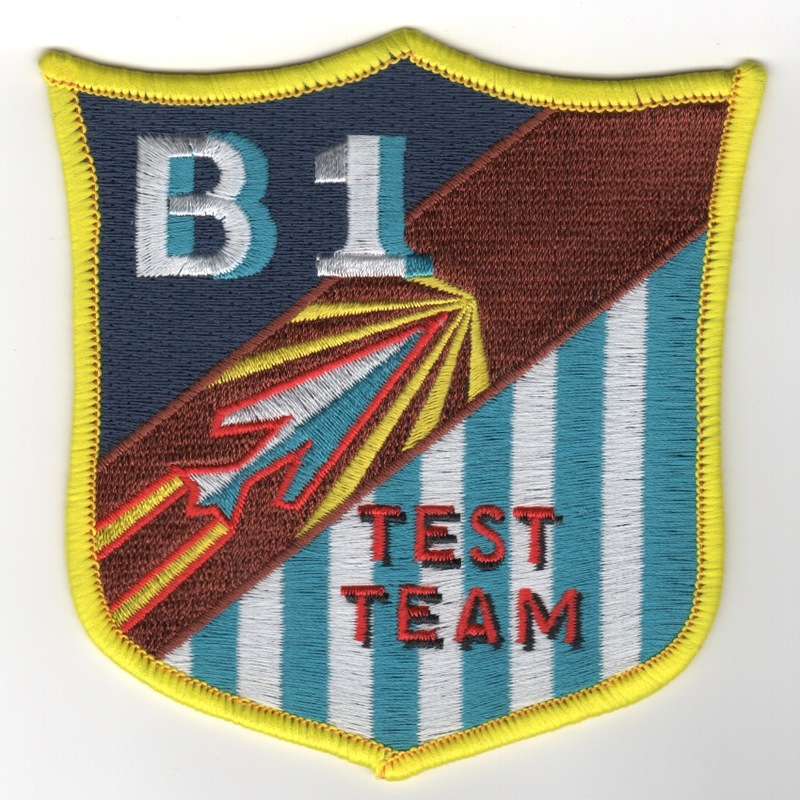 Use this link to get both B-1B Test Team patches at a discount. This light blue bordered patch shows the B-1B ruling over the world, but has the SAC symbol also. With it's capabilities, it is able to strike any target in the world. 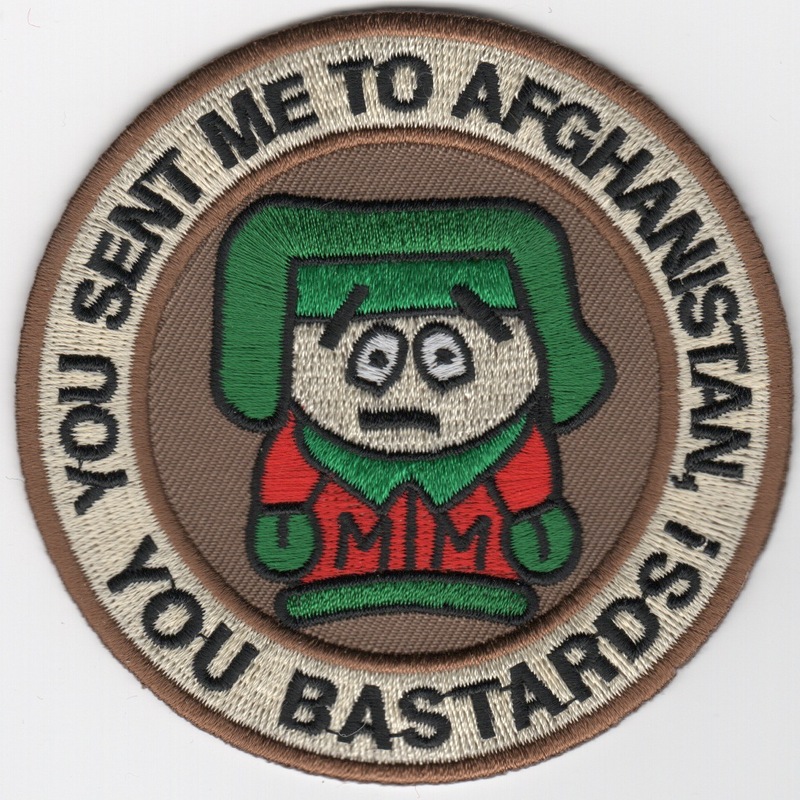 This is the color version of the squadron patch for the 266th Range Squadron. The 266th RANS run the RADAR threat simulator systems for the Idaho training range complexes, that is why they have the state of Idaho on their patches. They are a division of the Idaho Air Guard. Homepage | Order B-1B Patches!